Alex: You know we'll be lucky to see anything bigger than a chipmunk, right? Courtesy of Capitol Records, under exclusive license from Universal Music Canada Inc.
Been a long time since i have watched a movie and felt real fear in the pit of my stomach as a result, but there it is. Back Country kept my attention well enough to keep me watching, maybe because i wanted to see what happened to the couple, or maybe because i like the outdoors. Hmm? Dunno but in the end i am glad i watched Back Country. 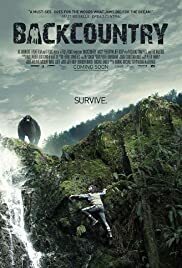 I am a horror fan, and a thriller fan, and , well a movie fan all around, but lately i have been trying to watch a movie that made me feel frightened, and scared deep in my stomach. Weird? maybe, but that is how i used to feel when i watched a truly scary movie unlike now when i find myself grossed out and feeling a little like a just watch something illegal more often than not. Maybe i am becoming jaded? who knows, who cares! This movie made me feel that old nervous and butterflies in my stomach kind of scared so i am grateful! Watch Back Country and enjoy yourself because i sure as heck did! 51 of 83 people found this review helpful. Was this review helpful to you?